Recommended ships: Completed in (1) Maelstrom w/ passive tank and (1) Maelstrom w/ Shield Transporter in 2 hours, but recommend more support. Completed in (2) passive fit Drakes with shield recharge rigs, had to warp out once each till the frigates were destroyed. Total time including salvaging 1 hour. Completed in (1) Nighthawk with Passive Tank, (1) Dominix with Large Remote Shield Reppers, and (1) Maelstrom with 8x 1200mm 'Scouts' for DPS. At gate's destination, NPCs surround your warp-in point at distances between 15 – 25km with Missile Batteries at 55km. Full Room aggro upon warp-in. Use a passive tank. Or plan a capacitor that recharges or receives 80 Units/s. Lowering Incoming Damage: Missile Batteries, Frigates and Destroyers won’t spawn more ships so consider taking them out first to reduce incoming damage. Mission is flagged complete when the named battleship (Spawn 2c) is destroyed. 1. You need a covert ops frigate. You need the covert op cloaking ability. Build the covert op ship with the covert op cloak, an afterburner, overdrive(s) and as much shield or armor buffing as you can. You want the ship to go 280m/s or more. 2. Make a battleship with an improved cloaking II and as much DPS as possible. You must be able to target at long range, I was able to have a range of 195km and had no problems, the further the better. If you do this right, you will never have your shields go below 50% (Caldari). 3. Get your covert and BS at the gate, make sure they are fleeted together and you have your watch lists up. Send in your covert op ship first, arrive in the mission cloaked. 4. 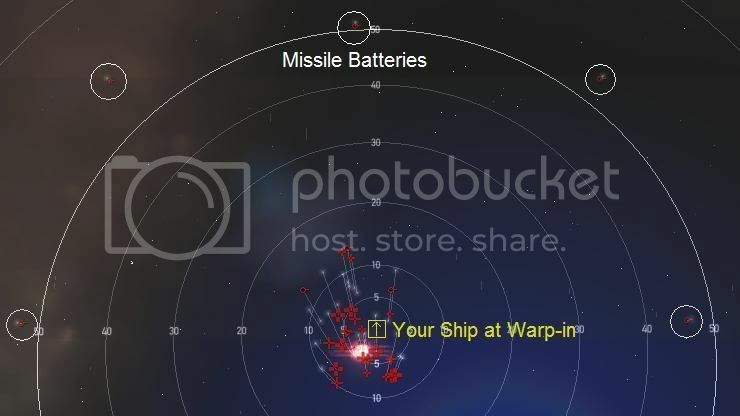 The big group of ships is below you and the webifiers and neuts are above with missle batteries all around. This is good. While cloaked head downwards at 45deg angle so you slip between the missle battery ring and the large group of ships that are below you. When you clear them, head straight DOWN. 5. While it's heading down get the BS to warp in. Timing is EVERYTHING. The split second you come out of warp tap your cloaking device to turn it on. If you mess up, GET OUT ASAP and try again (if you can). So your covert ship is heading south and your BS is sitting still, cloaked, in the middle of a big mess. 6. When your covert ship is 165km away from the CLOSEST missle battery (they don't hit past that) you uncloak. The whole kitten kaboodle will start to target you. Wait until they ALL target you. Your cap will dissapear and you will be webbed but you won't be taking any damage for a long while yet. 7. When all have targeted your decoy covert op ship, uncloak with the BS and start to head UP to increase the distance between you and the hoard of drones chasing the covert ship (117m/s for a raven was plenty of speed). Target in this order: WEBIFIERS FIRST (allows your decoy to remain far ahead of closing drones). Take out the neuts second, the faster the better. Start taking out any missle batteries that are targeting you (one does, the rest do not, but none of them are firing at you). Webs gone, neuts gone, all missle batteries gone. Take out the frigates chasing your covert ship if you can, otherwise start pounding the fastest ships first. Never stop moving if you can. Be careful if you do. There are respawns that will spawn around the mission entry point. Watch your covert op ship carefully, when the ship starts to take damage you can either have it increase it's speed (afterburner if fitted) or just warp it out and take down the incoming ships that will be targeting your BS. Use the distance between your BS and the drones to make that decision, too close then apply more speed, far enough then warp it out. I have used this tactic successfully twice now. I used it for 1 of 3 and this mission. I have a feeling it will work for all of these as well as a lot of other missions. I blitzed the mission in my passive Tengu, 1 BCS 4 SPR and was able to tank all even with Stasis-Towers and Missile Batteries alive. Total time from warp-in to mission completion was around 15 minutes. Ashur Ylavun named BS was very resistant in armor against EM, but Scourge Fury worked well on him. No reason to blitz this mission IMO. These are fairly straight forward L5 missions, and the Drone goo is highly valueble. I dont say you need to blitz it, if you like to loot and salvage its much nice drone metal to reprocess. I just said its possible to do so with ignoring all other damage and going straight for the goal. That was in my Tengu, with my passive NH (5 SPR II, 2 LSE II, 2 Exp&1EM Amp, 2 CDFP II) i needed to kill the Stasis-Towers and Missile Batteries to be comfortable. Afterwards I blitzed too (no loot-ship close, and being not in my main mission-area), worked well. Named BS was this time Milena forgot second name, but also high EM-resist on armor. How to two man? Torp Golem + Basilisk = Done in 40 minutes. * to trigger group 2a its needed to kill not only the mentioned trigger cruisers, but also the destroyers from initial spawn. The frigs dont need to be killed. * the strain frigs have the ability to scram and web, although they dont seem to do it that often. Done in Nightmare with a logi (2 caps, 2 shields) in 27 minutes from accepting, flying 3 systems away and killing everything. Did this in about 40 mins in a poorly fit Tengu, had to warp out twice. Id recommend a logi. did this and the first part in dual RR stratios. I warped out twice before the neuting sentries were gone, after that tank held. it took a while, so its not the most optimal way of doing it, but I kept getting scanned out, so having a safe + cloakies is nice. did it again in RR eos/ishtar with links. it was even faster than dual strat. Ishtar got neuted while eos got dps'd, buffered until neuts gone, no warpouts.